Beautiful gift plaque for Mom; God Could Not Be Everywhere, Therefore He Created Mothers. 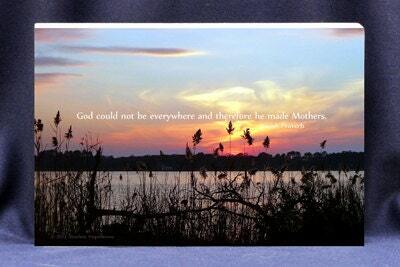 Beautiful sunset photo, message for Mom and a gift plaque all in one! Why send or give an ordinary greeting card! The Inspirational Photo Block © Better than a greeting card and the gift that keeps on giving! ***We can add a short message such as: Love Maria or Love You Mamma or I Love You - Maria, using your name of course! This can be added directly onto the gift plaque for a more personalized gift. If you have any questions please call us at 302 892 2572 to discuss or start a conversation with us on Etsy. Please leave us a phone number to reach you as well should we have any questions. Thank you for stopping by!